Oh to have a million pesos for Baby #CamillaClaudette! 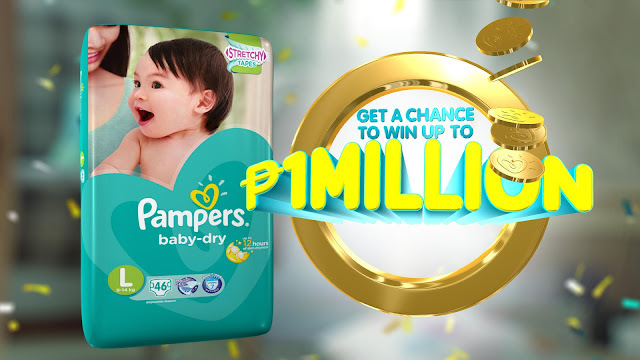 Pampers definitely got my mind working when I saw their “Win your Baby’s First Million” Promo. Especially since we only use Pampers Baby Dry at home. It’s only diaper that Ron and I trust to give us worry-free night. But what would I do when (Yes, when! Coz I’m joining this contest, too!) I win ONE Million Pesos for Claud…. The Disney movie Blank Check back in 1994 came to mind! Hahaha! I already imagined getting a bigger home with lots of space for her to roam around. I’ll buy her the latest toys and gadgets and to immediately enroll her in progressive learning daycare to make sure her brain is fully stimulated for advance learning. A Disney trip is trip is probably in order when one has a million pesos in their hands. But such amount doesn’t come by often. The husband and I discussed that 1 Million Pesos could easily become 3 or 4 million pesos if we invest it wisely. There will be more things Claud would need when she grows up and though we know we will work hard to give everything to her, investing that 1 million would benefit her more. We will also use a portion to ensure her education. We want Claud to be able to pursue her dreams. To go after what she’s passionate about. To choose the course and career she wants rather than to be tied to a course just because it’s the one that will land her a job right after college. I don't want her to feel hindered and though I know I will bring her up to be conscientious and good, I still want to give her unlimited options. But seriously, we just want her to personally enjoy her first million. So if you ask me what we’ll do? We’ll make sure that that ONE MILLION becames several millions by the time she’s grown up and able to decide what she wants to with it. So it’s definitely a great thing that we only use Pampers Baby Dry. I’ve come to depend on Pamper’s Baby Dry ever since I was introduced to it. Also, the people at home who care for Claud as learned to depend on this diaper to make sure Claud is dry. It’s so easy to put on despite Claud squirming like crazy during nappy-changes. Pampers really do ensure that my CLaud achive her firsts and so much because she sleeps better at night. No wonder Pampers Dry is the best and they ahve been around the passed 10 years making the lifes of parents like me so much easier and happier. And top it off, they are making one baby's firsts come true with a chance to win up to 1 Million pesos! And since I know one of you will win this, allow me to congratulate you already! For more information, visit Pampers Facebook Page.